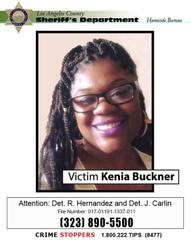 It was not long after midday on Monday, January 16, 2017, when Kenia Buckner lost her life. The 31-year-old mother of three was in her apartment when her ex-boyfriend, Antowan Ladell Parker, Jr. walked in the front door and shot her in the chest with a handgun. The incident occurred in the 16200 block of Cornuta Avenue, in the city of Bellflower. At the time of the shooting, little eyes of the ten-year-old daughter Kenia and Antowan shared were in the room and saw the tragic event unfold. Kenia’s mother, a ten-year-old niece and other family members were also present; they dialed 9-1-1 and watched the victim lose her life. The shooting occurred at 1:35 P.M. and Kenia was pronounced dead by paramedics within minutes. Antowan, now a murder suspect, fled and was last seen running southbound on Cornuta Avenue. Kenia and Antowan shared three children together: A set of ten-year-old boy and girl twins, and a four-year-old daughter. The children have not seen their father since the incident, and Sheriff’s Homicide Bureau detectives are looking for him, as well. At the time of her death, Kenia was a hairstylist, seeking to advance herself and her family’s lifestyle by studying at a local college for a career in nursing, ironically, to provide professional medical services to patients in need. She was bubbly and kind, and kept a close, loving relationship with her family. “We’re just looking for justice,” she said, asking for Antowan’s location to be revealed. “Please. Please. Please help me,” she wept. Mayor of the city of Bellflower, Dan Koops, spoke in support of the Buckner family by announcing a $5,000 reward approved by the city of Bellflower, offered in exchange for information leading to the arrest and conviction of Antowan Parker. “…with that money and the support of our law enforcement, and our city and the surrounding areas, we believe we will have a beneficial result at the end,” said Mayor Koops. Lieutenant Steve Jauch, investigative team leader for the Buckner case, described Antowan Parker as a male Black, 31 years old, standing between 5’9” and 5’10”, weighing approximately 230 pounds, with brown eyes, the name “Kenia” tattooed on the front of his neck, and a long, dredlock hairstyle. Antowan may have cut his hair short or shaved it to change his appearance and avoid being recognized. 9-1-1 and notify police of his location. 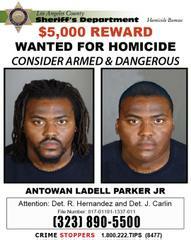 If you have information about Antowan Parker, Jr. or his location, please contact Homicide Bureau Detectives Ralph Hernandez or John Carlin at 323-890-5500.